I really wanted a case for my iPad and I never actually looked for one, as Rok and I mostly use the iPad at home, so having a case was never truly necessary. But I bought some white felt on Monday, and on Wednesday I decided to just make my own case. 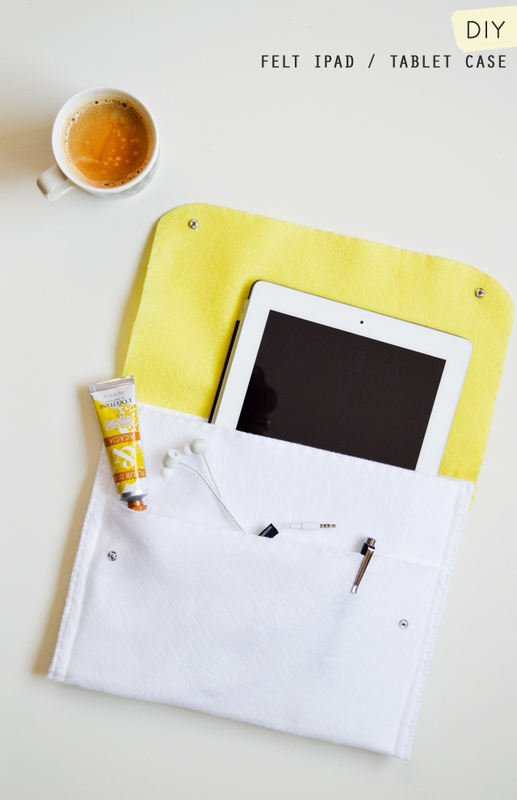 This case is big enough for many other tablets as well, and it also has a smaller front pocket for storing things like earphones, tablet pens, and in my case hand cream, ha. Or you can just skip the tablet and carry around a book instead, or a sketchbook. This is a fun project and it doesn’t take a lot of time to make, especially if you use a sewing machine. But no worries! You could still put this together without one. You can of course use other colors, I think white and gray would look great together. 1. 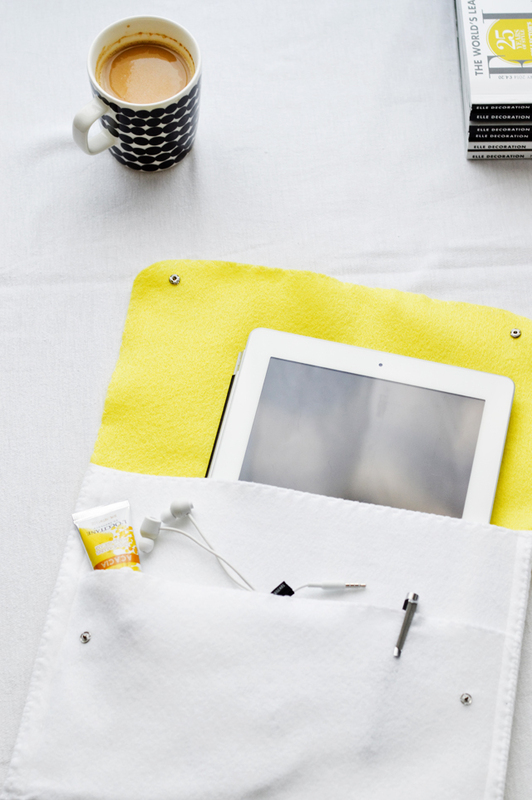 Take the large piece of white felt and put it on your desk, horizontally. Measure 22 cm (8.7 inches) from the left edge towards the center and make a mark there with a pen (or use a pin). That is where you will vertically place the small piece of white felt. Pin the two pieces together, so that they don’t move. Then using a basic stitch, sew them together vertically where the large piece and the left edge of the small one touch. Place back on the desk in the same position as before. 2. 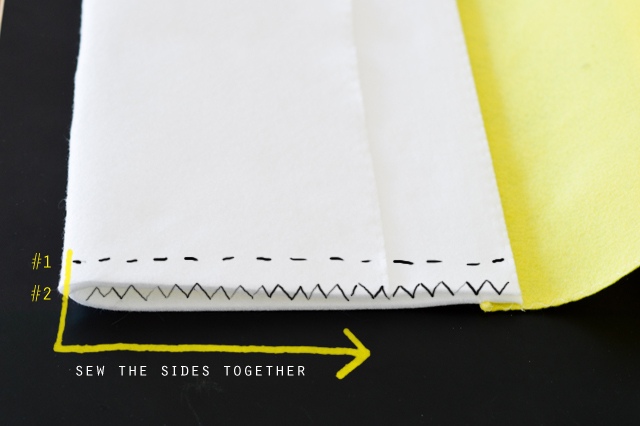 Take the yellow piece of felt and fold it in half, lengthwise. Trim two corners simultaneously, so that they become round. 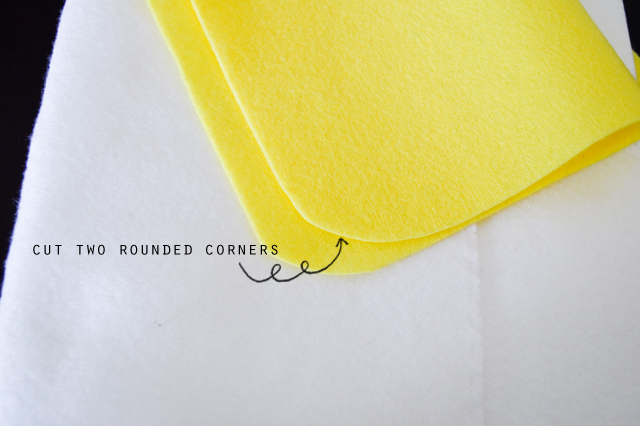 Unfold the piece and you will have two square corners and two rounded corners. This will make the case look a lot nicer, once it’s all put together. 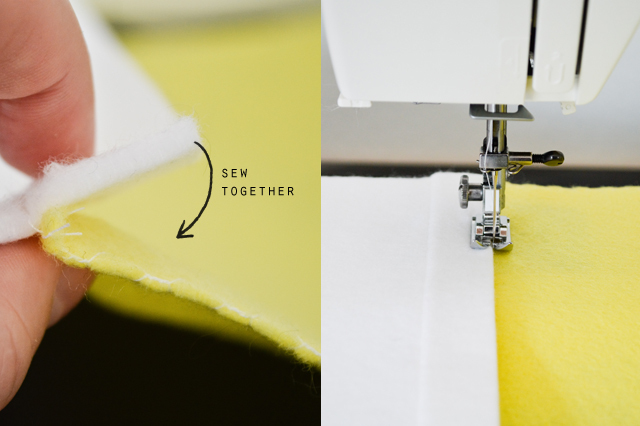 Using a zigzag stitch, sew all around the yellow piece, so that you get a nice pattern (this step is optional though). 3. 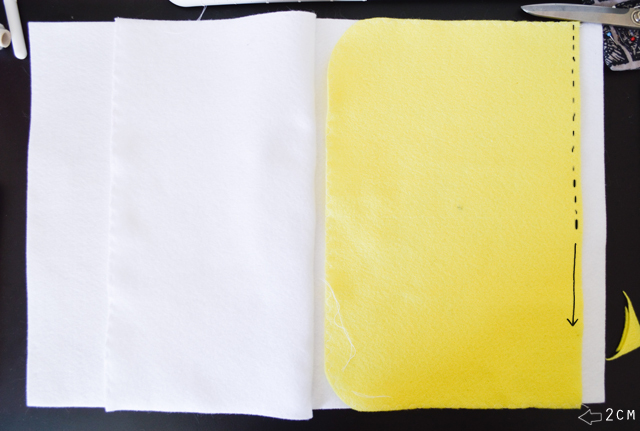 Put the yellow felt on top of the white piece (with rounded corners on the left, and square corners on the right), vertically, 2 cm (0.8 inch) inwards from the right edge of the white felt. Using a basic stitch, stitch together both parts. Now flip the whole thing around and you will see that the thicker white felt is sticking out a bit, over the yellow felt. You will now stitch those two pieces together again, using a zigzag stitch. 4. You now have everything in one piece and you can now roughly see the shape of the case, if you fold it together. Now you just have to finish the sides. 5. 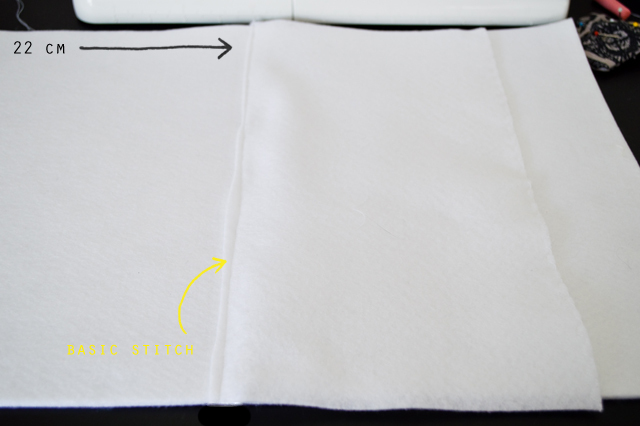 Fold the larger white piece of felt in half, and fold the smaller sewn on white part over it. This is the front pocket. Pin the layers together at the sides, about 1.5 cm (0.6 inch) from the edges. With a basic stitch, you will now join the white layers together from top to bottom, about 1 cm (0.4 inch) in from the edges. Then sew the layers again, as close to the edge as possible, using a zigzag stitch. This will give you a nicer finish. 6. Take some white thread and a needle and sew on the Prym snaps on each side of the case – two on top of the white pocket (on left and right side of the case), and two under the yellow cover (where the snaps meet). You are done! I hope you like the case. Thanks so much, Anne! 🙂 I’m glad you like it.